Recent advances in organic photovoltaic technology has resulted in efficiencies reaching all time high values (≅ 8:13%). A key element determining the power conversion efficiency of organic photovoltaics (based on the bulk heterojunction concept) is the final morphological distribution of the electron-donor and electron-acceptor subregions. Therefore, significant additional improvement in power conversion efficiency is possible through better morphology control of the organic thin film layer during the manufacturing process. This vision, however, is being hindered by the lack of tools to provide intermediate three dimensional snaphots of the material distribution within the active layer of organic solar cells during the fabrication process and tools to relate structure with device properites, thus facilitating the optimization of the fabrication process. to develop the first comprehensive three dimensional computational framework for predicting morphology evolution during solvent-based, thin-film deposition processes. It can be used as a ‘stereological microscope’ to visualize morphology evolution from early stages of phase separation until the formation of the stable morphology. It is especially important to obtain three dimensional data in order to analyze the overall organization of percolating networks within the bulk heterojunction. By delivering the ability to directly observe and interpret three dimensional images of intermediate morphologies, insight into the intrinsic complexities of the constituting subprocesses (that affect the final morphology) can be gained. 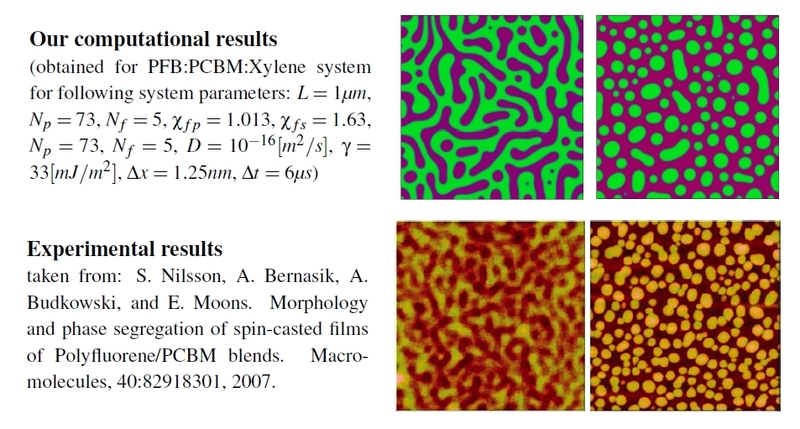 It is worth emphasizing that currently three dimensional morphology has only been visualized via electron tomography (only for the stable morphology). to provide a broad suite of morphology descriptors to link fabrication processes with structure and properties of organic solar cells. Detailed knowledge of process-structure-property relationships is the cornerstone for optimizing processing conditions to achieve high-efficiency OSCs. The morphology (i.e. the quality of the paths to the appropriate electrodes) is affected by the processing conditions (like evaporation rate, substrate surface) and both the processing conditions and the morphology affect the property of the final device (like current generation density, final efficiency of the device). One of the main questions in optimizing fabrication process of OSCs is to rationally link morphology with processing conditions and the final property of the device. Considering the large number of process variables and system variables which affect the morphology, linking structure and property is done via extracting physically meaningful morphology descriptors from morphological data. Bulk Heterojunction for Organic Solar Cells”, (in preparation). open morphology analyzer for organic solar cells application”, (in preparation). bulk heterojunction polymer solar cells: Phase field approach”, (in preparation). Society of Engineering Science, Ames, IA, Oct 3-6, 2010.
presented at the 2010 MRS Spring Meeting, San Fransisco, CA, Apr 5-9, 2010.